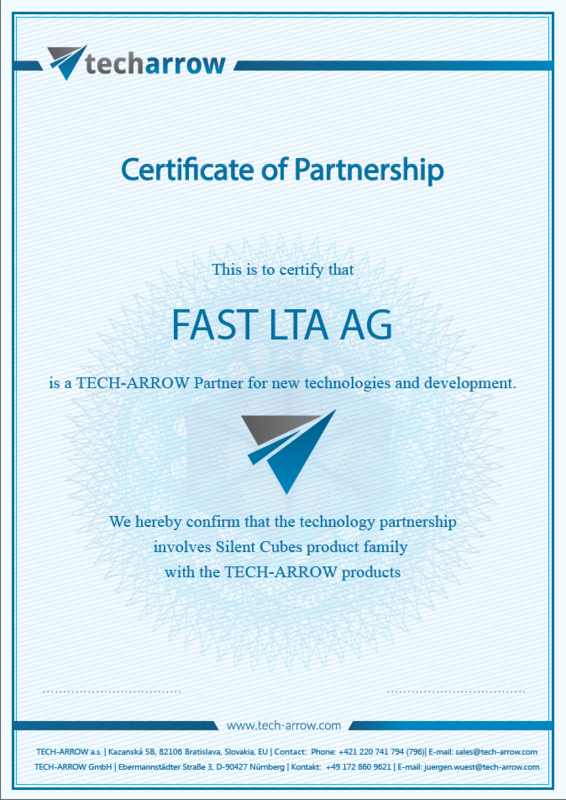 We are proud to announce our new technology partner, FAST LTA AG. Our teams have successfully tested the contentACCESS solution on the Silent Cube Compact hardware. This innovative, ultra-secure storage system from FAST LTA takes the performance and security of our solution to a new level. Both contentACCESS File and Email archive support all the advanced features of Silent Cube. Simple archiving, 2nd level authentication, replication are working smoothly, the collaboration with different WORM configurations of Silent Cube are also no problem for contentACCESS. Store the documents archived by contentACCESS extra-safe and efficient on this great storage platform! The Silent Cube Compact is best suited for smaller and medium amounts of data, e.g. DMS/ECM, HIS/RIS file archiving, modality archiving, email archiving. The Silent Cube Compact solution integrates all components for revision- safe long-term storage into a thermally-optimized and compact cube (half 19-inch width, 6 HU) – an extremely space-saving and energy efficient solution. Its four redundancies, two power units for redundant power supply, and two Gigabit Ethernet interfaces to enable expansion with additional long-term storage units makes it not only ultra-secure but also highly flexible.